Pondemonium 2014, an event that is going to change EVERYTHING! I'm sitting on my flight bound to Newark, NJ out of Chicago, and I find myself feeling almost electric after spending the better part of a week at the headquarters of Aquascape Inc for the largest Pond Industry Training Event in North America, Pondemonium 2014. I am coming back to New Jersey with a palpable excitement about what will surely become the single most important time in the Water Feature Industry - The Premier of Pond Stars on NAT GEO WILD. My mind is racing about the amazing opportunities that lie ahead for the entire industry, especially our Certified Aquascape Contractor (CAC) family and the impact it will have on the people that are going to be introduced to the Water Garden Lifestyle that we create each day. 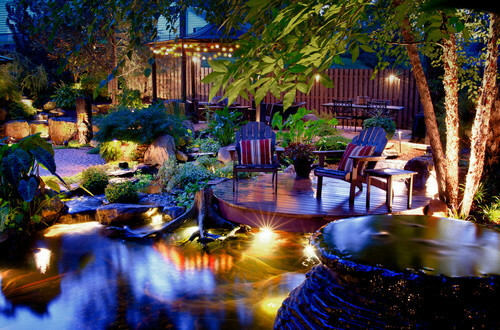 As Greg Wittstock, Owner of Aquascape, is often heard saying: "Everyone Wants A Pond, They Just Don't Know It Yet". EVERYTHING IS CHANGING on September 9, 2014! A YEAR'S WORTH OF EXPERIENCE SHOE-HORNED INTO 1 WEEK! That's probably the best way to describe Pondemonium! If there is one thing that Aquascape is known for, it's the incredible amount of time and resources they spend on educating their contractors and giving them real-world experience to be the best water feature builders in the world. The format for Pondemonium 2014 was flipped on it's lid this year with the introduction of 2 separate tracks - 1 for the Business Owners and 1 for their Foreman. The week began with Foreman/Rookie training. Lessons on Pond Ecology, Skimmers, Biofalls, Rock Selection and Hands-On building were all covered in this 2 day working classroom. Aquascape understands how important it is to have your key guys trained properly and what that means for the success of your business. All the participants enrolled in this intense training curriculum were exposed to basic techniques for excavation, rock placement, filtration components and edge treatments. The excited and grateful response I received from my own foreman told me all I needed to know about the value of this new format - Priceless! After the initial instruction, everybody was split into groups and charged with building their own pondless waterfall as a team. This exercise helped enforce the importance of working together as a cohesive unit to complete the task on time, with a beautiful outcome. Pond Tour with a purpose. Wednesday brought a Chicagoland Pond Tour and another chance for the Foreman/Rookies to learn. Aquascape trainers challenged them to analyze the water features they were visiting and breakdown sale price, cost of construction and profit. This is an extremely useful skill for someone that is responsible for keeping budgets and time-frames in mind on a job-site. Overall, the Foreman/Rookie training was a smashing success! The Big Boys Get To Play! Pondemonium usually starts for me on the golf course with my "East Coast" buds, and this year was no different! I'd say the single biggest benefit I get out of attending Pondemonium each year is the networking. Being able to talk about struggles, successes, innovations and the future with a bunch of "Pond Guys/Gals" that are going through the same things is something I truly value. These people have become some of my very best friends and we are most definitely a tightly knit family. Something you will absolutely NOT find in any other industry! 6 a.m. rolls around real fast Thursday morning as I wake to the sound of torrential rain and thunder. Today is the day that the "Big Dogs" in the pond world love the most, the annual "CAC ONLY" Advanced Build. It's usually comprised of an incredible amount of big boulders, heavy equipment, an unrealistic goal and lots of chest-thumping & one-upmanship......in other words, a Pond Builder's dream! Oh yeah, did I mention it was raining? The site for this year's Advanced Build was Farm Friends, NFP, a not-for-profit facility that assists individuals with special challenges and their families. They provide suitable workshops, enjoyable recreational activities, and therapeutic programs for people with unique needs in a peaceful, rural farm setting. We are taking a stagnant earth bottom pond and retrofitting it with a wet-well intake for debris/invasive floating weed removal, a constructed wetland filter for better water quality and a large scale boulder waterfall that will flow approx. 20,000 gallons per hour. This is no problem for an experienced group like this, because we've got a week to finish it and lots of sunshine. Scratch that... it's raining and we've only got 1 day! Perseverance and Tenacity are 2 words that I would use to describe this talented group of individuals. Over 100 business owners banded together and overcame adversity through the rain and mud to bring a centerpiece to this farm that will be enjoyed by many special needs people for years to come. This build was a true testament to the resolve and teamwork of these dedicated professionals, and I am always in awe when we overcome what seems like insurmountable odds to complete an extraordinary task. I am very proud to be a part of the CAC family and these pictures should give you a good idea why! Friday was spent honing our business acumen with everything from internet and retail sales training to operations and hiring/engaging your employees. Workshops were led by Veteran Aquascape employees as well as some of our peers offering their years of experience in respective categories. Friday night was capped off with an outing to Top Golf as a fundraiser for the Aquascape Foundation. We were able to raise money for an amazing cause and reconnect with friends in the process. Saturday was kicked off with a fantastic keynote speaker named Jim O'Connor. He is an ex-Navy Seal and delivers a very powerful message about how to be a leader and succeed with the team around you. Jim set the tone for the rest of the day's workshops, which included sales, marketing, maintenance and fish with Doc Johnson. All the seminars were well put together and extremely informative. The last day of Pondemonium is always capped with awards and recognition for some of Aquascape's Top Frogs (customers). 40 of our peers in the Pond Industry were recognized for their accomplishments and this year Atlantis Water Gardens came away with #15 in sales in the U.S.
Alden Zove of Cedar Run Landscapes in North Wales, PA accepting the "Conservationist of the Year" award for his green community involvement with the city of Philidelphia. Carl and Michelle Petite from Columbia Water Gardens in Hemet, California accepting the Businessman of the Year award for their achievments in Pond Retailing, Internet Sales and Construction. Jaak Harju of Atlantis Water Gardens in Denville, NJ receiving the "Water Feature Artist of the Year" award from the Pond Stars of Aquascape in recognition of his artistic talents in waterfall and pond design & construction. Great recap of an event I'm proud to say I was apart of. Congrats Jaak on artist of the year, I know how badly you wanted that. I also know how deserving you are of that award having had the pleasure of working with you on a few builds. I always look forward to working with you at camp hollow. Well done Jaak.. great job on recap and congratulations to being "Top Frog" & "Artist of the year"!! Looking forward to the future! ! Jaak, you are "the best of the best"! You sooo deserved this honor. I intend on sticking close to you in hopes of learning and getting better myself. "Iron sharpens Iron"! Prefect recap! Amazing people doing amazing work! Congrats again on artist of the year! Great recap! Congrats on the top frog and artist of the year!